In 2009, Congress passed the Health Information Technology for Economic and Clinical Health (HITECH) Act to modernize the U.S. healthcare system through the implementation of Electronic Health Records (EHRs), software systems that create a digital version of a patient’s medical chart. HITECH incentives accelerated widespread adoption of EHRs. However, the ability to exchange information between different EHRs across various healthcare settings — known as interoperability — was not a key requirement when the digital systems were first developed. Eight years later, EHRs are in place at almost 80 percent of physician offices,1and doctors are increasingly reporting that interoperability is important. 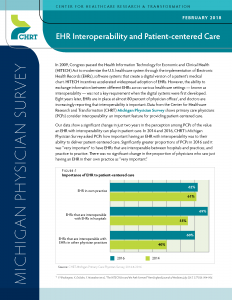 Data from the Center for Healthcare Research and Transformation (CHRT) Michigan Physician Survey shows primary care physicians (PCPs) consider interoperability an important feature for providing patient-centered care. While younger doctors are more likely to say EHRs are important, increasing numbers of doctors of all ages are embracing them. Regardless of how long they have been in practice, there was a substantial change in PCP views on the importance of interoperability from 2014 to 2016. 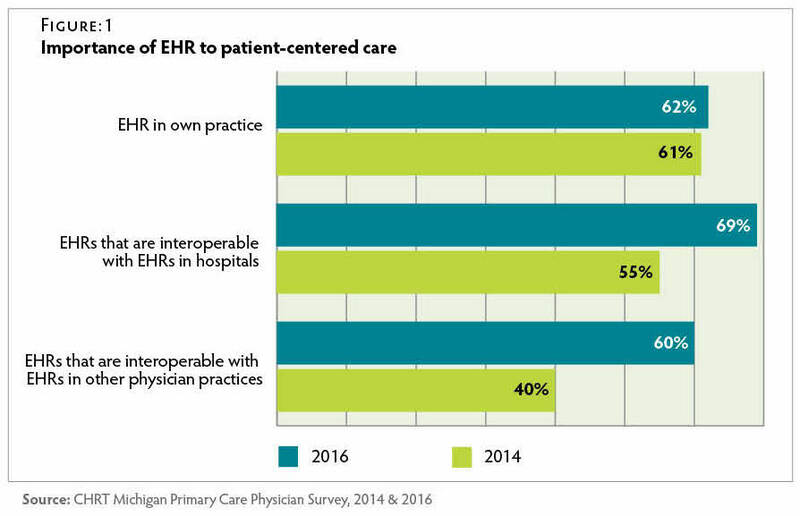 In Michigan, primary care physicians increasingly see the value of interoperable EHRs. So far, however, their promise has been limited by incompatible EHR infrastructures and a lack of guidelines for the ways that health care data is described and recorded.2Efforts are underway nationally3 and in Michigan to improve interoperability and the ability of providers to access information across settings.4This represents a critical next step in the evolution of EHRs as a tool for physicians to deliver patient-centered care. V. Washington, K. DeSalvo, F. Mostashari et al., “The HITECH Era and the Path Forward” New England Journal of Medicine, July 2017, 377(10): 904–906. Government Accountability Office Report to Congressional Committees. Electronic Health Records: HHS Strategy to Address Information Exchange Challenges Lacks Specific Prioritized Actions and Milestones. (Washington, D.C. 2014): https://www.gao.gov/products/GAO-14-242. Office of the National Coordinator for Health Information Technology, 2017 Interoperability Standards Advisory (ISA) Reference Edition. (Washington, DC, 2017) https://www.healthit.gov/sites/default/files/2017_isa_reference_edition-final.pdf. To support and develop statewide interoperability, MiHIN has established the Use Case Factory®. A use case is a specific type of data exchange that models interoperable processes across EHRs such as by submitting immunization records to the Michigan Care Improvement Registry or notification to a primary care provider clinic about a patient’s admission, discharge or transfer from a hospital or emergency department. For more information, see: Use Case Factory – MiHIN. (Mihinorg, 2017):https://mihin.org/use-case-factory.